Great effect for a Deck that can pull it off -- HORRIBLE activation trigger. Gren Maju decks, decks that use DD Scout Plane, decks that use Return from the Different Dimension...there are many decks that can actually benefit from removing all monsters -- let alone the benefit of your opponent not having any. I also see Black Luster Soldier as benefiting from the effect; if he's the only monster left in the game (as he'd still be on the field), and then he was killed via a field-clear or something, that pretty much guarantees the person who gets recursion first will win (unless some GREAT combo is set off by the Inferno Tempest player). The BLS player has 3 ways to bring it back (Reborn/Premature/Call), and the opponent only has one (their Reborn). The Bottom Line: You should win just for successfully activating this thing. More so than any other card reviewed this week, Inferno Tempest needs its own deck to work. Being a Quickplay would normally give it a lot of versatility, but the fact that you can only activate it when you take 3000 damage from an attack sort of kills that. 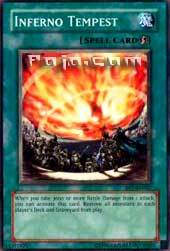 One thing to note is that you activate this card in the Damage Step. The effect is amazing. Removing all monsters from both player's Decks and Graveyards will leave your opponent with only what he has on the field and in his hand, and those will usually be dealt with fairly easily. If you can get rid of your opponent's monsters, chances are he won't be able to finish you off; and you will be able to kill him easily, since Burners (which is what Inferno Tempest fits into) have more than enough ways to take out LP without monsters. The problem is getting your opponent to attack you for 3000. Not many people want to take a direct attack from BLS-EotB or CED-EotE; but there is another way! LAVA GOLEM! Not only does Golem fit into Burn as well, but a Burner will also almost certainly have ways to keep the Golem from attacking. Of course, you may view this as a bad thing; if Golem can't attack, how is it going to attack you for 3000? It doesn't have to. It's as simple as ramming a Sheep Token into Lava Golem. The 3000 damage is done, and you can activate Inferno Tempest, after which you'll probably have the game in the bag. It has a lot of potential, but it needs the right deck to work. Stats: Inferno Tempest is a Quick-Play Spell card. This is pretty great, as on your turn, you can catch your opponent by surprise and activate it from your hand. In all reality though, there are not many alternatives aside from being a Trap (worse), or being a “residual” effect like Final Countdown (better, but loses the element of surprise). Effect(s): A killer effect with a restriction that nearly kills any chance of using it well. This card removes every monster from either players deck and Graveyard from play. The catch, you gotta take 3000 or more Battle Damage, you know, damage from battle. Hard to handle, but not impossible. Uses/Combinations: Fortunately, there are a few obvious uses. One is in a Lava Golem Burner deck, you give them a 3000 attacker. You also keep if from attacking. This card makes nice insurance if you can’t keep it down, or you can just activate Scapegoat and ram a Sheep token into it. In addition to those, you can use things like Creature Swap and, Power-Ups, and Rush Recklessly to achieve the needed attack difference. Finally, the excellent reason for doing this is… Gren Maju De Eiza. Its ATK is 400 x the number of removed from play cards. So it can easily become a 4000 ATK Level 3 Fire Fiend. Return From The Different Dimension could also work. Ratings are the same-the slightly more level Banlist playing field is balanced by the loss of one excellent patsy for this card-Injection Fairy Lily. Casual: 3/5-I’m giving it a more or less average score. Why? Its one of those effects that should give you a win if you get it off. It’s just so hard to get it off. Tournament: 2/5-Even harder to get off here, but who is going to bother side-decking against it? Again, I think we have a game breaking card that was a little over-compensated for. Still, it’s not as horrid as I fear most will make it out to be. I wonder if you could chain it to Kuriboh (since effect’s resolve backwards). I can't name them all. chaos monsters. It might work, it might not. This card is the equivalent of a one-trick pony. It's really a gimmick card that relies on some farfetched concoctions to successfully utilize. Perhaps the most reliable trick is to combo it in conjunction with Lava Golem. Let them attack you, trigger this card. Great, right? Of course it's much more difficult in practice. You're going to need a full fledged burner for this card to be effective at all. Let's check it out. Advantage F/H: Any card that serves one highly specialized, restrictively situational purpose, and serves no use in any other function whatsoever does not provide any form of advantage. Therefore, such cards should not be used. Of course, the tremendous advantage gained by successfully pulling this one off gives it half a point. 0.5/10. Best Draw for the Situation: As I said, any card that serves only one purpose is not a card that provides advantage. The corollary is that you don't want to draw cards with no advantage to them. Perhaps this will work with Lava Golem, but that's about it. 0.5/10. Attributes/Effect: This card is one of a kind. It's the only card in the game that possesses such an effect. Of course it deserves a perfect score in an Inferno Tempest deck, so I suppose I'd be rating the Inferno Tempest deck itself. Unfortunately, the triggering of this card is near impossible, making the deck itself worthless. 0/10. Dependability: In a word, no. 0/10. The Bottom Line: The point isn't to assail creativity/originality. Unfortunately, the main problem with my reviewing system is that it's geared towards competitive play. Therefore, "cool" cards such as this one suffer mightily. You're going to need Lava Golems, probably. You're going to be running a burner deck, or possibly even incorporate Monday's Return from a Different Dimension. The goal is to take 3000 damage, then burn your opponent down using spell cards (since most trap burn cards are based on opponent's monsters). Of course the build is weak, but I'm sure it'll be fun. Typical burn cards include: Poison of the old man, wave motion cannon, ookazi, tremendous fire, and others. Also include standard burn cards and monster removal (in case they have numerous monsters in hand at time of activation). Good luck.